After nearly a decade-long hiatus, the Black Eyed Peas are back, but not as the band the world knew them as. With the release of their new album, “Masters of the Sun Vol. 1,” the Black Eyed Peas rebranded themselves as returning back to their hip-hop, pre-Fergie roots. In fact, Fergie does not show up on this album at all. While the album is a clear move away from the pop, dance song days that built up the Black Eyed Peas’ popularity, it is a successful example of incorporating activism into art, focusing more on imbuing their music with meaning and soul rather than giving it the pomp that would appeal to the masses. The album was produced by will.i.am, with the title seeming to reference his graphic novel “Masters of the Sun ― The Zombie Chronicles,” published by Marvel Comics. Like the album, the comic deals with expansive issues like that of gang culture, but it is clear that the comic allows for more creative leeway. While the album is full of nostalgic hip-hop tracks addressing various societal problems from gun control to police brutality in America, the songs do so in very subtle manners. The album opens with a song titled “BACK 2 HIPHOP,” rebranding the trio as going back to their roots, with gentle ’90s beats. The bridge, in particular, has a very ethereal sound, as featured artist, Nas, and the band sing, “Bring it back / It’s a resur-re-rection bring it back.” The song establishes the way in which the album was not just going back to the hip-hop genre in sound but also in content, with more pointed songs in meanings that can double as slam poetry without the background sound. However, it is clear which songs were written in relation to particular events and more focused on making a statement, with substantially stronger lyrical content compared to the rest of the songs on the album. “RING THE ALARM pt.1 pt.2 pt.3” and “CONSTANT pt.1 pt.2” were written and released ahead of the full album after the shooting of Michael Brown in Ferguson and the election of Donald Trump, respectively. Similarly, “CONSTANT pt.1 pt.2” is lyrically heavy, but is able to more successfully strike the balance between having deeper meanings and implications and being a catchy, potential radio hit. 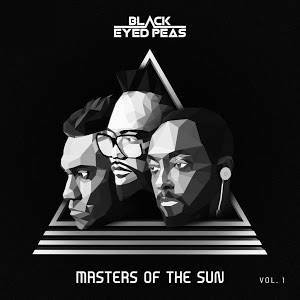 The song references the larger project will.i.am has created as the group sings, “Master of the Sun, we rocking these comics / Better beware, spiritual warfare.” As a more fast-paced track compared to other songs on the album, the song is a tribute to the old Black Eyed Peas days. Though none of the songs on the album are as catchy as past hit songs like “I Gotta Feeling” or “Boom Boom Pow,” remnants of their EDM and pop days can also be heard in “DOPENESS” and “BIG LOVE.” Fergie’s voice is replaced by other featured female artists, from CL to Nicole Scherzinger, giving songs variation in sound and a lighter mood. With “Masters of the Sun Vol. 1,” the Black Eyed Peas attempts to use their status as one of the most successful groups in the world 10 years ago to address prominent issues in society today. While many of the songs on the album are not made for the radio or the dance floor, the messages they spread on the album are clear. Inspired to use music for social justice, the songs are able to capture the intensity of the current political and social climate of America and a desperation to fix all the issues of today.